The Moriond conference is now unfolding up on the slopes of Mont Blanc. The real action -- the Higgs update from the LHC and the Tevatron -- will happen only on Wednesday. However, as in any other 007 movie, there is a teaser before the opening credits. On the previous week another conference known as the Italian Moriond took place in the same room of the same hotel on the same ski slope. It included the talk by Homer Wolfe that uncovered many details of the upcoming CDF Higgs analysis, although stopping short before the final shootout, that is before giving away the new Higgs limits. There hasn't been much expectation about the upcoming Tevatron Higgs update . That's because the previous Tevatron combination is based on up to 8.6 fb-1 of data and doesn't show much in the interesting mass range: only a broad 0.5 sigma excess near 125 GeV and the limits on the Higgs production rate at the level of twice the Standard Model cross section. Naively, adding 1 more crappy femtobarn should not change much, unless dramatic improvementd in the analysis. have occurred. Now, CDF claims that they do have a dramatic improvement! The most revamped analysis is the one where the Higgs boson is produced in association with a W or Z boson and decays into a pair of b quarks. 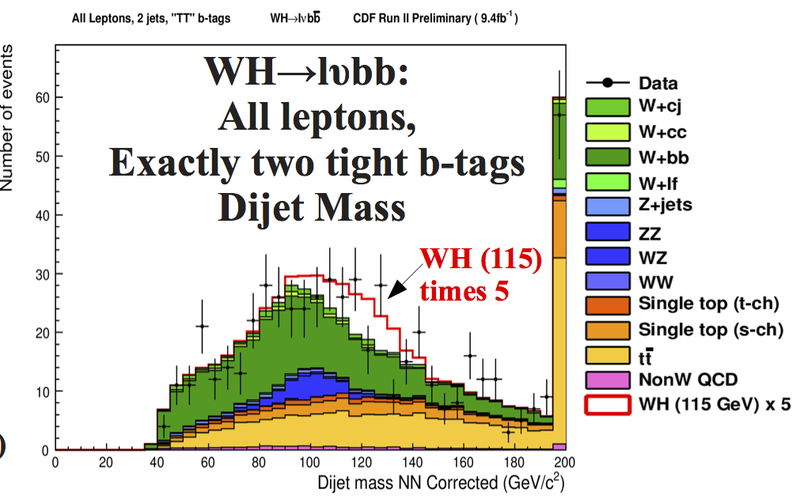 Much as at the LHC, W/Z+H is not the main production channel at the Tevatron. 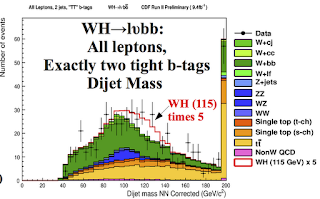 However, the charged lepton and/or missing energy from W/Z decay give a chance to trigger on the event, and thus pick the H → b bbar signal from the overwhelming QCD background. Luckily enough, W/Z+H is also the last channel where the Tevatron is still highly competitive with the LHC (the latter has to fight a much larger QCD background in this channel, and only later this year it will reach a sensitivity comparable to that of the Tevatron). 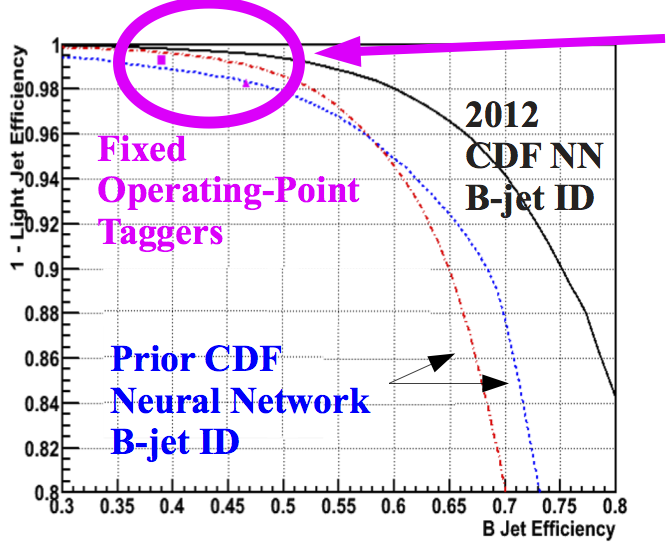 The news is that between now and last summer CDF has largely improved their b-tagging, with the efficiency gains reaching 40%. 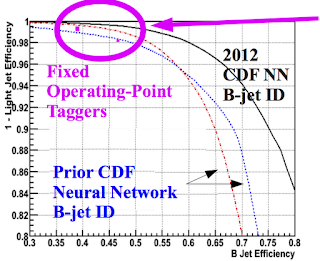 This is of double importance in low mass Higgs searches, as signal events contain two b-jets. Combining that with other smaller improvements, CDF expects to see twice as many signal events in the interesting mass range compared to the previous analysis. Correspondingly, the expected sensitivity for exclusion is now at about 1.4 Standard Model cross sections near 130 GeV, tantalizingly close to where the signal should pop up. the Higgs Search to Single-Top Discovery. to be closely converging to the red Signal+Background curve. to be closely converging to the black Background-only curve. might even be excluding it ? I think they're trying to say exactly the opposite. Daya Bay observes theta13 at 5 sigma!